Vishnu Purana and Bhagavatam mention Narakasura or Naraka as the asura son of the earth goddess Bhudevi (Bhumi) and Varaha (third avatar of Vishnu). He established the kingdom of Pragjyotisha (modern Assam) after overthrowing the last of the Danava king Ghatakasura. River Brahmaputra is one of the longest river in India. It originates in the Himalayas and travelling a long route merges in the Bay of Bengal. The most important provinces of India, near this river, are Assam, Kamarupa and Manipura. Assam is a name recent in origin, but Kamarupa and Manipura are quite ancient and are found recorded in the Mahabharata. Manipura is mentioned even in Ramayana, as Rama’s sons Lava & Kusha got married with princesses of Manipura (modern Manipur). The river Brahmaputra is described under the name of ‘Louhitya’, because it originates from a lake named as Lohita. Kamarupa was formerly known as Pragjyotishpura. This name suggests that it was a region to the east of India and was at a high altitude. Prag (Prak) means to the east. Jyotish means related to stars. So this name. Pragjyotishpura was famous due to Narakasura and his son Bhagadatta. Both were very brave. Bhagadatta participated in the Mahabharata war from Kaurava side. 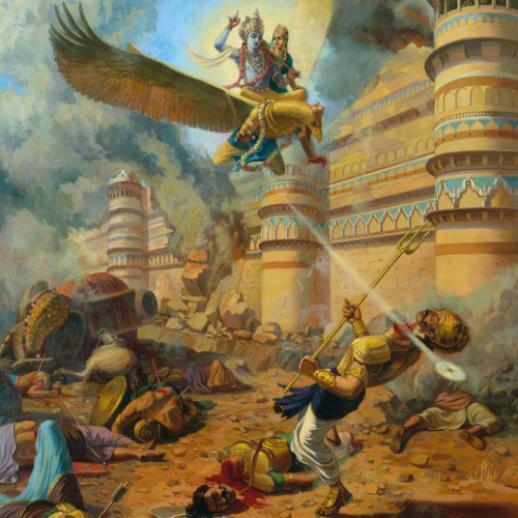 Hariwansha, part 1, Adhyaya 63 tells that Krishna killed Narakasura. Shrimad Bhagavatam also narrates the same story in Skandha 10, Adhyaya 59, where Narakasura is named as Bhoumasura, because he was a son of Bhoomi, the earth. Though called as Asura he was decent to ladies. He captured sixteen thousands and one hundred girls, but never raped them. It is the most important part of the culture. Valorously he had collected many precious gems and costly articles from all over the world. Thus he was the emperor of the world and so was supposed to be a son of the earth. He had defeated even gods and took away the earrings of their mother Aditi. For that fault, Krishna killed him in a war. Later Krishna became ‘Pati’ i.e. guardian of those 16100 ladies. In another version, Krishna fainted during war with Narakasura and Krishna’s wife Satyabhama continued the war to kill him. 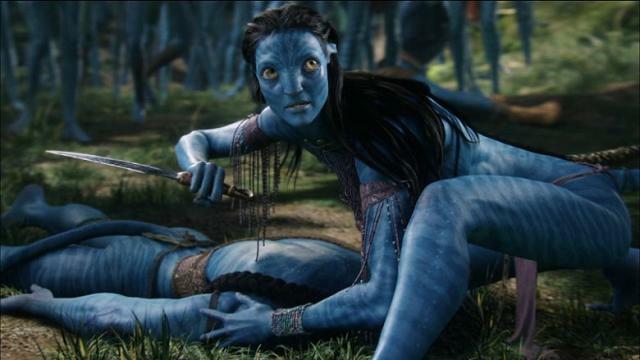 The same idea was taken in ‘Avatar’ movie, where Jake Sully collapses and Neytiri kills Colonel Miles Quaritch with an Arrow. Mahabharata, Vana Parva, Adhyaya 142 states that Narakasura was killed by Vishnu,and not by Krishna. This information was given by sage Lomasha to Yudhishthira when Pandavas entered the region of Assam to climb Kailasa and Gandhamadana mountains. Lomasha showed the heap of bony skeleton of Narakasura. It was also told that Kubera owned that land. Bhimasena entered this region to get a fragrant golden lotus when he met Hanuman. Thereafter Bhima defeated Kubera, and took many lotuses. It means that Narakasura was much ancient than the Mahabharata era of 3100 BC. Bhagadatta was not the son of Narakasura, but must be a descendent. The epic Mahabharata states at Vana Parva A.142, that Naraka did Tapasya for one thousand years to achieve Indra-pada, but Krishna killed him. Udyoga Parva 48 states that Krishna killed Naraka and fetched back the earrings of Aditi. Udyoga 130 states that one thousand girls were released by Krishna by killing Naraka. 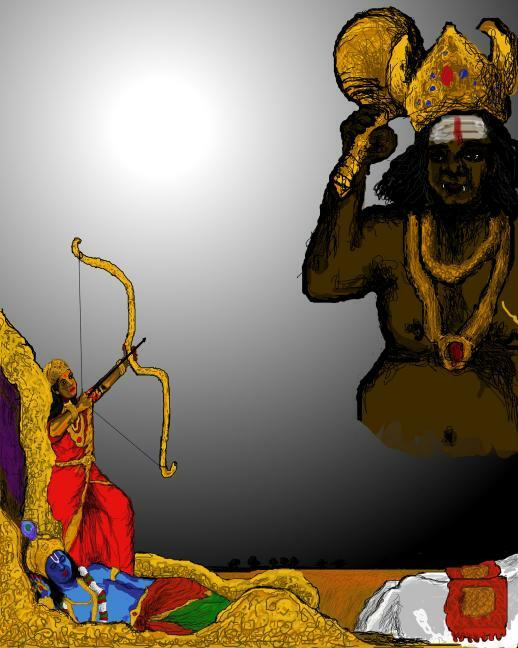 Drona Parva 28 states that Krishna gave Naraka the Vaishnavastra because of his mother’s request, the Astra went to Bhagadatta after the death of Naraka. All these differences indicate that Naraka was a very very ancient personality. Valmiki Ramayana is composed earlier than the Mahabharata. It also mentions Pragjyotishpura at Kishkindha Kanda S.42, stating that Sugreeva told Vanaras to search for Seeta in Naraka’s Pragjyotishpura. To establish the identity of Pragjyotishpura it is mentioned that it was of Naraka. It does not mean that Naraka was alive then, because in Yuddha Kanda S.69/7, Naraka’s death is reported in Ravana’s saying that just like Shambara died at the hands of Indra and Naraka died at the hands of Vishnu, Rama will be killed at the hands of me (Ravana). This Naraka was said to be procreated through Simhika (sister of Hiranyakashipu) and Viprachitti. His six brothers were Vatapi, Namuchi, Ilwala, Shrimara, Andhaka and Kalanabha. Harivansha 63/64 state Bhouma means Naraka, because he was the son of Bhumi, the earth, but who was his father is not mentioned. Vishnu Purana , Part 5 th , A.29/ 23-24 state that Varaha (Boar) incarnation of Vishnu was the father of Naraka. Shrimad Bhagawata (59) also states the same fact. Banabhatta in Harsha Charit also indicates that Bhagadatta was a descendent of Naraka and not the son. Copper plates of early Hindu kings of Kamarupa dated at 7 th to 12 th century AD,state Naraka as the son of Vishnu and the father of Bhagadatta. Except Bhaskar Varma of 7 th century AD, all the kings, Shalastambha and Pala dynasty state that Naraka was their remotest ancestor.